This is a great test tool to find how many amps your system is drawing or testing cells and much, much more. 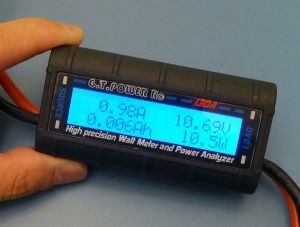 It connects between the battery pack and load to measure volts, amps, watts and amp hours. I bought one of these to begin recording data of motor/battery/esc/prop combos. The unit works very well, but only records the MAX value over the course of a run. It's a little bukly for smaller boats, but overall I'm very pleased with it for the price.